Back in the 1970s, almost every couple about to get married would have an electric knife on their gift list; it was the must-have affordable kitchen gadget. It was seen as the ideal choice for slicing meat for holiday feasts, or just for the Sunday roast. However, back then the promise of effortless carving didn’t always live up to the reality. The early models would often tear meat rather than cut it, leaving a shredded mess on the carving dish rather than perfectly portioned slices of beef, pork or poultry. After some failed attempts, often those early models of knives would be relegated to the back of the cupboard or the next garage sale. With many inferior models on the market at the time, home chefs went back to tried and trusted traditional knives, some never to return to an electric knife. But as they years have gone on the technology of electric kitchen knives has improved, to the point now they are once again a must-have, but this time it’s because of their quality and efficiency rather than the kudos of owning one. The new electric knives no longer cause a mess by shredding the meat or break down like the original models. If you like your meat, then an electric knife has to become part of your kitchen arsenal. What is an Electric Knife, Really? A typical electric knife consists of a blade or blades, and a handle or body which houses the motor. Electric knives usually have blades which are locked in place and are removable for cleaning and storage. The reciprocating blades can be interchangeable as some manufacturers offer blades for carving, and also for cutting bread. The motor in the handle of the knife provides power to the blade agitating it backward and forwards in a natural cutting motion. Most electric knives on the market have a cord to draw power from a wall socket. Some, usually more expensive models, are cordless and rely on rechargeable batteries in the handle to power the cutting motor. Modern ones come a long way from the models that first appeared almost fifty years ago. The horror stories of poorly cut meat, shredded to less than bit size pieces are a thing of the past. There has been a huge improvement in the design, efficiency, and practicality of electric knives. So much so, that the top chef who years ago would look at a knife which is electric with disdain, are now embracing the technology, and are likely to have one at hand to help speed up food preparation. Knife purists look on electric knives as a convenience item, not to be taken seriously. However, professional cooks will tell you that electric blades can provide a level of consistency not obtained when using a hand tool. Chefs who are in the kitchen daily preparing meat can find the constant sawing action of a hand knife tiring, and can lead to strain that can be alleviated by using an electric knife. Powered knives e also much easier to use when dealing with tougher meats, such as wild game. Also, people who have arthritis in the wrist or hand say an electric knife turn what was once a daunting task using a hand knife, into simplicity itself. We are not suggesting you throw out every knife you have in the kitchen and replace them with an electric knife. Not every slicing job in the kitchen needs a powered blade. In some cases, it would be like taking a sledgehammer to crack a nut. However, there are some kitchen tasks where the electric knife excels, and the advantages are easy to see. By its very nature, an electrical appliance means there is an element of time-saving in its use; this is entirely consistent with using an electric knife. Food preparation time will be cut down when using a powered blade. Because the blade is doing the work, the cook can focus on making sure the angle and the consistency of the cut are right, it’s especially useful when working with hard-to-cut items such as vegetables like squash or some poultry. There is also an element of time-saving using electric blades that do not need to be sharpened. Most hand knives need to be regularly sharpened to keep an edge. However, with the interchangeability of the blades on electric powered knives, that because almost redundant, as the better brands offer a blade for each particular cutting job. Most people who spend time in the kitchen have stories of how they nicked themselves with a hand knife when cutting something hard or tough. As the electric knife cuts through food with little effort, there is less chance of a nasty slip or accident. It might surprise you to know, that the best electric knives cost less than higher quality branded kitchen knives. Manufacturers of traditional kitchen knives often use their brand name to put a premium price tag on their products so that an electric knife can work out a lot cheaper than the manual alternative. 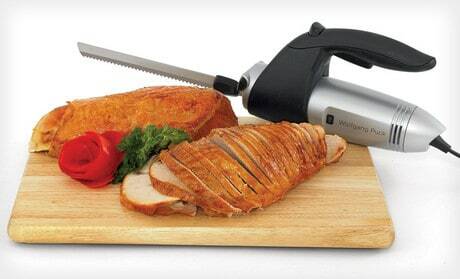 Cutting up a turkey by hand can take ten minutes, using an electric knife the same job can be done in a minute. Because the blades move rapidly they achieve a faster and more regular cut. Because electric knives can cut perfectly every time, with a little practice you will be able to cut thin slices of meat time and time again evenly. You use less force when using an electric knife than a manual one. The blades do the slicing without having to apply much pressure. A best quality electric knife will cost less than premium traditional manual knives. When choosing an electric knife, it’s first best to decide where and when you intend to use it. For most people that will be in the kitchen. For others, who like to barbecue, for instance, it might be outdoors. If you are a hunter or fisherman, and may need a powered knife with you to help cut up freshly caught fish or game. That will assist in answering your first question of whether you need a cord or cordless knife, the tradeoff being portability vs. power. Anything cordless means it will be running off batteries of some description, which invariably means they will drain with use. As battery power starts to run low the power of the electric knife will reduce, making it harder to cut. If you need the flexibility of a cordless knife, then best to check the battery life, and look for one that will not drain power too quickly. As a backup, you could purchase extra rechargeable batteries. A plug-in corded electric knife takes away all that worry, but it does mean you are umbilically linked to a power socket somewhere around your house or kitchen. That said, make sure the power cord is long enough to reach the area where you need to do your cutting, there’s nothing more frustrating than when its just a few inches short. However, for most people who are looking to use their knife in the kitchen, a corded appliance is their first option. Let’s next look at what the blades are made of. Most electric knives come with stainless steel blades. This type of steel has been used in blade making for centuries, so it is well proven. Stainless Steel is resistant to rusting and tarnishing, and if cared for will stand the test of time. Some newer composite substances are being used for blades, and they are beginning to appear on the market. Most modern electric knives use two reciprocating blades for the cutting action. Therefore with just a little pressure and guidance via the handle, the knife will smoothly slice through whatever you are cutting. Some of the premium electric knives come with an assortment of blades for different purposes; others have them available as extras at an additional cost. Other machines come with just one type of blade fitted as standard. In the blade kits, most feature a curving knife that can be used to cut meats and another for other kitchen cutting jobs. A number of manufacturers offer thin blades specially designed for filleting fish. Please see our section in regard to blade types for more information. Getting the right handle is equally important as the right blades. The handle has to fit snugly and firmly into the hand. As they blades move against each other, there is a deal of vibration, which can become uncomfortable if you are using the electric knife for an extended period. Best to look for a contoured handle which fits your hand. Make sure the on-off switch and any control buttons are easily accessible. Users agree that to get the best out of your electric knife, it has to feel right in your hand. If you can try it out before purchasing to check the weight and balance of the knife, it will be time well spent. With all electrical appliances, especially those with sharp blades, it’s important to make sure they are safe to operate. Check that the knife has a locking trigger or a double locking mechanism to prevent children being harmed. With all the models, the blades are detachable for cleaning and can be popped in the dishwasher after use. The handle or body of some electric knives can also be cleaned in the dishwasher, but please check the information provided by the manufacturer beforehand. While some manufacturers provide just a handle, cord and blade, others sell the complete package of a wooden block for storing, extra blades, multi-speed settings and other safety features. Remember all these extras will add to the price, and not necessarily the quality of the cutting. And when it comes to quality, manufacturers who have confidence in their product usually offer the longer warranties, so it’s often a good idea to take that into account too when choosing a new electric knife. You will find more information in regard to accessories below our reviews. Without a doubt, this is certainly one of the best looking electric knives on the market, and one of the most popular. The CEK-40 comes with two sets of blades for bread and carving, a polished wood block for storage on the kitchen worktop, and a 4-foot power cord. The elegant black body fits snugly if you are left-handed or right-handed, reducing the vibration associated with electric knives. The ergonomics make reaching the on/off switch easy so it one of the safest models available. The knife comes with an additional safety lock feature. Cleaning the blades after use is very easy with a simple release mechanism. The handle and blades can be locked onto the storage block after cleaning ready for their next use. Some users have reported problems with the plastic on the handle cracking, but that does not detract from this being one of the best electric knives on the market. If you are looking for a cheaper way to slice a loaf of bread, or carve the Christmas turkey, look no further than the Hamilton Beach 74250. It cuts well above its price tag, delivering professional results every time, with no mess. This Hamilton Beach model has 7.5-inch serrated blades powered by a motor of 100 watts. The slim elegant knife makes short work of beef, chicken, lamb, turkey, fish and bread, and comes with a carving fork 12 " long to steady that roast or barbecue so the electric knife can do its work. The ergonomically designed handle has a non-slip trigger. When not in use, the electric knife and fork can be stored away in a compact storage case. Some users have reported the 74250 model does get hot with extended use. If the town meets the country in an electric knife, it's in the American Angler Pro. With the bright yellow ABS plastic body, it is more used to being seen on a boat or a campsite than a kitchen worktop, but don't let that fool you. The American Angler Pro is everything you need in an electric knife for the home and the outdoors. Apart from the five blades for various cutting applications, the kit comes with a Teflon mesh glove for filleting fish, and mesh bag rather than a carrying case. There is probably not a cutting job in the kitchen this knife could not do with ease. With a powerful motor uses an all-metal transmission system to give a powerful, consistent blade action, with lots of torque and stutter-free cutting. Venting in the body means there is no buildup of heat during extended use. We have talked about the time-saving, and energy saving of electric knives before, and this knife has the additional plus of being space saving too. The Wolfgang Puck packs a great deal of punch into a small body. The motor has the strength to carve, cut, and slice its way through just about anything a kitchen can throw at it. The machine comes with two interchangeable serrated blades, which are super sharpened to carve meat, fruit, and vegetables effortlessly making food preparation very easy indeed. What makes this knife different is a rotary handle which allows it to be used by left and right-handed people. It also allows cutting at three separate angles, giving straight, angled or flat cuts. The WPEKF015 comes with a switch which assures double safety for the highest protection, and the ergonomic handle makes it a joy to hold and use, and offers exceptional control when carving food. The adage of a hot knife through butter was likely coined for the Rapala Electric Fillet Knife; this is probably the best electric fish-filleting knife available. It will also make short work of most meat like pork, beef, lamb, or chicken, even if it is partially frozen. Unlike most of the other electric knives on review, the Rapala has a thin blade specially designed for filleting. A powerful heavy-duty motor means the blade runs at twice the speed of most other electric knives improving its cutting ability. The Rapala can cut through rib bones, backbones and fillet all kinds of fish. An extra long 8-foot power cable means it can be used just about anywhere. Some users have reported that the reciprocating blades can become unattached during use. However the Rapala Heavy Duty Electric Fillet Knife comes with a one-year warranty, and the blades are dishwasher safe. This is the unsung hero of electric knives. It may not be the prettiest, or the most powerful, or come with many added extras, but the 74311 is certainly one of the cheapest and most durable electric knives on the market, making it probably the best value for money available. The knife has a strong motor, and serrated stainless steel blades to slice bread, meat, or just about anything. The lightweight design and the contoured hand grip makes it comfortable to hold, and precise when cutting. It has a single button control and is great for both left and right-handed users. Users are surprised at how long lasting the 74311 model is for the price. Because it is so cheap, many people use it outside the kitchen for home craftwork, such as cutting upholstery foam, and other jobs where quick cutting is needed. If you are an avid baker, you will know that rye bread and some thick wheat bread can be difficult to cut. The Black and Decker EK700, with its long 9-inch blade, makes short work of slicing any loaf. The design of the EK700 has the stainless steel serrated blades offset in the handle, which can be a little offputting when used at first. Even so, the ergonomic grip of the handle makes the Black and Decker and comfortable electric knife to hold and use. The sleek red, uncluttered design of the BELLA 14527 underlies its simple charm of doing its job effortlessly. This is a tried and tested electric carving knife which slices perfectly thin slices. Although the Bella is priced at the lower end of the market, it still retains all the versatility and precision you get from more expensive brands. The general consensus among users is that it is great value for money, and does the job you would expect. This is an all-rounder electric knife able to cut and slice a variety of products in the kitchen. The serrated blade makes it good for slicing bread and also cheese. The stainless steel blades should not need sharpening and are easy to clean. The blades can be detached by using the convenient eject button on the top of the handle. The on/off switch is located on the bottom side of the handle grip, which some users have found a little difficult to get used to. A great knife with 2 serrated blades and easy eject. The design has stood the test of time, and many users describe the simple and well proportioned electric knife as on of the easiest to use. With a simple on/off switch and eject button on the top of the handle, there is little to get in the way of the perfect carving. The powerful 120-Watt motor means it can cut just about anything. Some users have commented on the blades flexing when in use but does not affect the quality of the carving. With a mid-range price, this is an electric knife that should never let you down. If you are new to the world of electric knives then you may find yourself confused and lost when it comes to all of the different brands and features that are out there now. As we stated earlier, electric knives provide the user with precision, removable and replaceable blades, speed, less effort, and reduce pain to the hand or wrist. Luckily, this article will help any newcomer to know what kinds of electric knives are on the market and what features you should look out for. To be honest, there are not many different types of electric knives out there. You mainly have two choices to choose from—an electric carving knife and an electric fillet knife. Most of these sets come with interchangeable blades for use on different foods. However, you also have choices on whether or not you want a cordless or one with a cord (see our Cord or Cordless section above). These knives are mostly popular during Thanksgiving because they are excellent to use to carve a turkey. But you can definitely use this knife all year long on other types of meats as well. When purchasing one, you will need to look at what kinds of blades come with it. If you are buying a carving knife, it is recommended that the blade is long for carving meats and shorter blades are useful for foods such as bread and vegetables. When you are looking for a good filleting knife, you should search for a blade that is non-corrosive, as well as strong and durable. Generally, these blades are stainless steel. Another thing to look into is a blade that allows the user to use with tight angles. The size of your blade should at least be seven inches long; however, this solely depends on the meat you are filleting. You also want to consider a comfortable handle because this will provide the user with control. Many electronic knives come with features for you to choose from. Here is a look at 3 of the most important features to consider. As we already discussed in our Cord or Cordless section, with a cordless model, you have to worry about the battery running out of juice. You also have to worry about when the battery starts running low because the electric knife will not cut as well since it needs power. This fact can make a cord electric knife more appealing, however the cord can keep you from being able to move appropriately. Another disadvantage to this type of knife is that, depending on which model you have, you can also be sacrificing power with a cord electric knife. Fortunately, for those who are indecisive, you can have the best of both worlds because there are models out there that allow you to switch between cordless and cord mode. If you decide that a corded one for you, then you will want to consider the length of the cord to make sure that it is suitable for your needs. However, if you do decide on a cordless model, then you will want to make sure that you know how long of a battery life it has. The blade material is a crucial part of an electric blade because this is the part of the knife that takes the hit when it comes to work. A stainless steel blade is the most popular choice because it is capable of staying up to par for a long time as well as rust and tarnish resistant. You can find replacement blades for any model or brand name electric knife you may own. This is because old blades become dull and worn out. With replacement blades, you can keep your knife working like new. Depending on which model you may have, you can find carving blades, bread blades, and fillet blades. You may also be able to find certain sizes or blade weights you are looking for. If you just so happen to break, misplace, or just want a spare handy, you can find a charger for your specific electric knife. You can search for universal chargers that fit any model or you can go straight to the source by ordering one from the manufacturer’s website or Amazon. If you use your electric knife regularly, then you may want to consider keeping an extra charger on hand because it is a crucial necessity for your electric knife in order to charge the lithium battery that powers it. There are numerous cases for electric knives that can be found. Some products will come with their own cases. However, if your specific model did not come with one or you are looking for a new one, then there are plenty that can be found. Cases range from your simple storage needs to ones that you can easily travel with. You can find one that is a carrying case that features comfort grips, designated interior spots for each tool, and snaps tightly shut to prevent spillage. However, it is important to note that if your case comes with designated spots for certain tools then you may want to look closely at which model the case may be for. Generally these cases were designed to fit a certain electric knife model. You can find replacement batteries for your electric knife on Amazon or your manufacturer’s website. Whether you just find yourself wanting a spare or need one as a replacement, you will never want to run out of power. Avert this situation by charging one battery while the other is in use. Do not let your knife run out of power if you use it regularly! You can also find that certain manufacturer’s sell a combo that include both the charger and battery. Some electric knives provide a thickness adjustment guide that allows you to consistently slice the perfect thickness of meat each time. Unfortunately this piece can wear over time and become damaged, so a replacement for this part may be inevitable. Some electric knife sets come with a carving fork. If you happen to have bought one that did not come with one, then you will be able to purchase one from just about anywhere. Carving forks are actually pretty common and help you support the meat that you are carving. This tool is especially helpful when it comes to electric knives. They can help prevent you from nicking your fingers while you are cutting or filleting. Safety starts when you come to buy your electric knife. If the knife is not comfortable in the hand, or too heavy, then it will be difficult to control and could lead to slips and accidents. First, check that the electric knife you are buying is right for you, and is light enough to control easily. Once you have got your new electric knife read the instructions carefully, as they will give you specific safety advice relating to the model you have just purchased. When using your electric knife to cut meat, grease, and oil from the food could find itself on the handle, which may make it harder to grip. Good models come with a grease guard which stops this sort of thing happening. they have been described as scaled down versions of chainsaws, and need similar safeguards. All good brands come with an automatic lock down system, where the device will switch itself off when not in use. The user, therefore, has to engage a button or switch to power the electric knife and letting go of the switch will automatically turn it off. The power cable should also be waterproof, and meet US or EU safety standards, details of which are in the accompanying instructions. All knives are sharp and can inflict injury if not handled in the correct manner. Electric knives, because of their rapid motion, are even more dangerous when not handled properly, so it is important always to take all the necessary precautions to stop anything getting in the way of the knife that you do not intend to cut. It has been important when considering our ten best electric knives to make sure the machines are made from high-quality materials. Of all the culinary gadgets, electric knives are probably one of the most underrated, as it should be regarded as a precision tool like any other kitchen knife. An electric knife should last years even though it is one of the less expensive kitchen purchases, so durability is a factor taken into consideration. We have made sure that the electric knives reviewed are easy to use and safe to handle in the kitchen. Even though an electric knife is one of the simpler kitchen tools, it is import to make sure it is easy to strip down for cleaning after use. If you want to get the best out of your electric knife, then it is important you clean it properly. This will ensure it lasts a long time, and prevent any contamination from blades. If food debris is stuck to the blades, the best method is to clean them up by hand. Always remove the blades from the handle before cleaning or soaking. Most blades are dishwasher safe. Once the blades are clean and dry, they can be reattached to the handle and stored away for next time. Q: Can I sharpen the blades? Yes, if they are straight blades you can sharpen them with a sharpener. If the blades are serrated, you can use a simple sharpening steel. Only sharpen the knife once it’s cleaned. Q: Should I choose a Cordless or a Corded One? There is no doubt a cordless electric knife is more convenient than a corded, but there are drawbacks too. If you are intending to curve or cut a lot with the knife then being plugged into an electricity supply will give you peace of mind. This is a simple hand tool, and with a cordless version, there is not a lot of space for a battery. As such, it is not going to last a long time. On the other hand, a corded electric knife will be able to run and run and run. So if you are looking for sustained, reliable cutting power go for a corded electric knife. Q: How good is it at cutting? The small electric motor powering the blades means they are moving much faster than you could do manually. Therefore the cutting is more rapid and places less strain on the user. Because you don’t have to put work into the cutting, you can be more precise, and therefore cut your meat, bread, or vegetables thinner saving waste. Compared to the electric knives that first came onto the market decades ago there is no comparison with their modern equivalents. The newer models are provided with durable and sharp blades, made of much higher quality materials. The precision of the cutting is considerably improved too. This tool is an actual labor saving device, which should be in every kitchen cupboard. Whichever electric kitchen knife you choose, you will need to make sure that it is suitable to your own needs and you feel comfortable using it. It is also good to remember that the more blades you have, the more versatile your knife will be.